How does the author of the book of Jude introduce himself in relation to Jesus Christ? 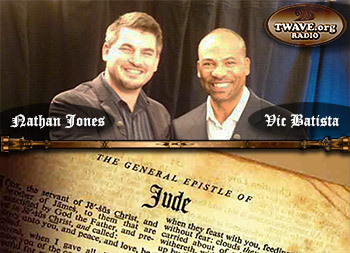 In this "The Truth Will Set You Free" TWave Radio episode, Pastor Vic Batista of Miami's Calvary Chapel Aventura and I will embark on a study of the little book of Jude from a prophetic perspective. Vic Batista: Our subject matter covers the prophetic book of Jude with its theme of contending for the faith. We are going to dive into this incredibly short but profound book of the Bible. Nathan, introduce us to the book and then open by reading the first four verses. There are those who might not be familiar with the little book of Jude and so may find it very hard to locate. Nathan Jones: Jude isn't terribly hard to find if you go to Revelation then back up one book. Of course, Revelation is located at the very end of the Bible. Go back one and you've found Jude. Vic, you are right. Jude is short. It's only a page or a page and a half long, depending on the font size of your Bible or screen. For a book, it is only 25 verses long. Really short! "Jude, a bond-servant to Jesus Christ, the brother of James, to those who are called, sanctified by God the Father and preserved in Jesus Christ; mercy, peace and love be multiplied to you. Beloved while I was very diligent to write you concerning our common salvation, I found it necessary to write to you exhorting you to contend earnestly for the faith which was once for all delivered to the saints. For certain men have crept in unnoticed who long ago were marked out for this condemnation, ungodly men, who turn the grace of our God into lewdness and deny the only Lord God and our Lord Jesus Christ." Vic Batista: This power-packed book comes with an equally great introduction. You opened us up there in verse 1 with, "Jude, a bond-servant of Jesus Christ." And what exactly is this relationship he mentioned — bond-servant? Nathan Jones: Jude notes himself as the brother of James, and James we know was one of the leaders of the Early Church. To track James down, go back to Mark 6:3. There in this Gospel Jesus is shown teaching and Mary, the mother of Jesus, shows up. She brings her whole family. Mark 6:3 reads, "Is this not the carpenter, the son of Mary, the brother of James, Joseph, Judas, and Simon? And are not his sisters here with us?" Mary's family was embarrassed and even a little offended by their half-brother Jesus. In Mark 6 we discover that Jesus had half-brothers and at least two sisters through Joseph and Mary. The Catholic Church teaches that Mary was a perpetual virgin and never had children, but right there in Mark 6:3 we learn that Jesus had four half-brothers and at least two half-sisters. One of these half-brothers was James, who wrote the book of James, and the other one was Judas, or Jude for short, who wrote the book of Jude. So, we know then that this book of Jude was written by one of the half-brothers of Jesus. When Jesus was here proclaiming His earthly ministry, His brothers thought He was a nut. They'd distanced themselves as much as possible and wanted nothing to do with Jesus. It wasn't until Jesus was resurrected that all of a sudden at least two of His half-brothers and half-sisters came to faith in Jesus as Savior. It would be kind of hard if a relative went around saying he was God, right? You, too, would think your brother was a nut and would do everything to distance yourself. But, when Jesus came back from the dead, His resurrection radically changed their view of their half-brother. From then on, they wouldn't even call themselves "the brother of Jesus Christ," for they would consider themselves too unworthy to be called a relative of the risen God. Jesus' half-siblings would disassociate themselves rather than take on such an honor. Therefore, here Jude calls himself a "bond-servant of Jesus Christ." In other words, Jude is rather taking on the role of a servant of the one Lord and God, even though he's technically in at least earthly form his half-brother. Vic, can you imagine if a sibling of yours all of a sudden went around claiming he was the Messiah? You'd think he was nuts. And then, all of a sudden, you find out He is the Messiah! That must have been a terribly humbling experience for Jude. Vic Batista: We can find in every relationship strains among family. I come from a family where I have six brothers and three sisters, so I know how strained it can become. When I came to know the Lord personally, it was so difficult for my brothers and sisters to accept. Sometimes in life your own siblings just won't accept you. Nathan Jones: This family friction is what Jude had to contend with. It's wonderful to see that at least James and Jude gave their hearts and lives to Jesus Christ. They realized that Jesus was here in bodily form through the Virgin Mary at the time, but He wasn't sired by Joseph. These half-brothers knew that Joseph wasn't really Jesus' father, and they accepted that. They knew that God was Jesus' father, and so they were willing even to be martyred for that belief. And they were, because we know that James was killed for his faith. So, this is where we start off with the book of Jude. We start out learning that both James and Jude were leaders of the Early Church. In the second segment of our study of the prophetic book of Jude, we'll explore Jude's plea for those who have a "common salvation" to content for the faith. Very Good Article, thanks for sharing the information...I haven't read Jude thoroughly, but I will now. That is very interesting book of Jude, Jesus half Brother considers himself a Bond Servant to Christ. We are all servants to Christ. Even in that short book of Jude we learn so much don't we. They knew that God was Jesus' father, and so they were willing even to be martyred for that belief. And they were, because we know that James was killed for his faith. Where do we find that James, the half-brother of Jesus was killed for his faith? We know he is dead, but where do we find how he was killed? So good to hear this study has been a blessing to you! "Fox's Book of Martyrs" is the best source for Church historical and traditional records telling the stories of how Christians since the Church was founded had died.